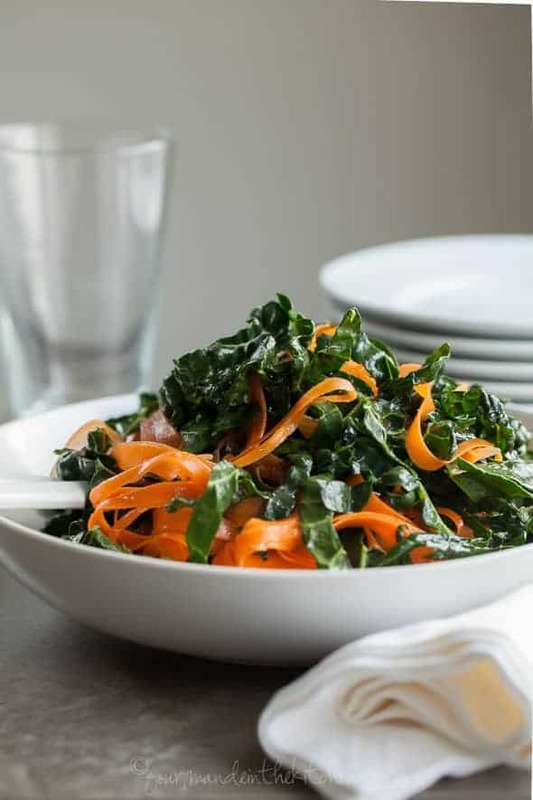 Ribbons of kale and carrots with earthy, warming spices like, cumin, coriander and cayenne make for a wonderfully hearty and satisfying salad any time of year. 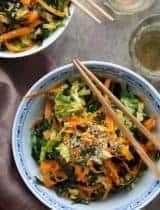 This salad is all about layers of textures and flavor; it’s one of those dishes that wakes up your taste buds with each bite. 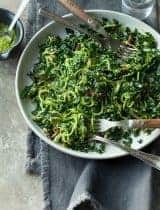 It makes for a lively winter meal, although it’s quite well suited to every season really since the ingredients are available year-round. 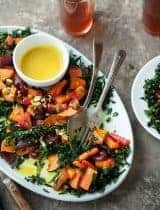 On the plate it’s a colorful tangle of carrots and kale ribbons tossed in a spicy Moroccan inspired dressing you can twist and turn around like pasta on a fork. The flat fettuccine-like shape of the vegetable ribbons is a nice surface for the dressing to cling to. The dressing is bold with the flavors of cumin, cayenne and coriander. There are golden raisins and black olives for sweetness and saltiness, and fresh orange juice and white wine vinegar for brightness and acidity. 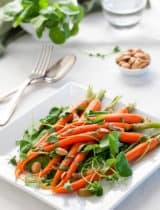 Simple, fresh and raw, this Moroccan kale and carrot ribbon salad holds up well at room temperature and even benefits from being made ahead of time, which makes it a great choice to pack for lunch. The key is to allow some time for the flavors to marry. 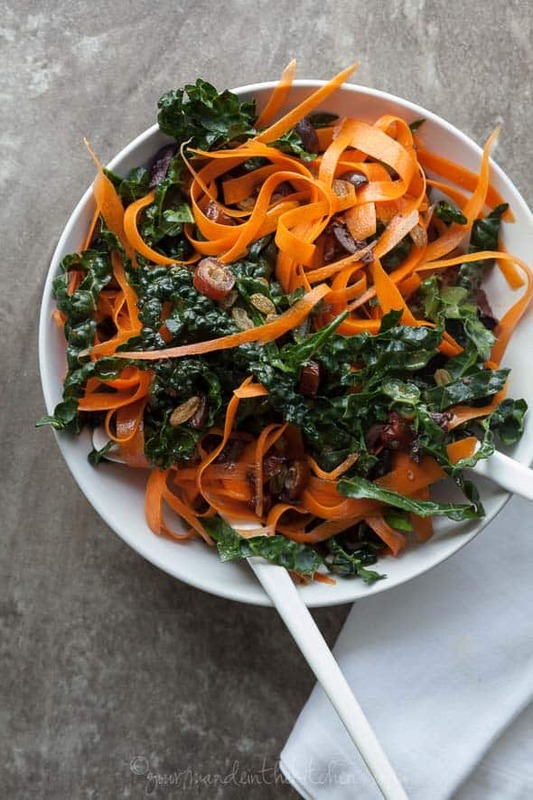 The raw carrots and kale turn tender and more noodle-like the longer they sit in the dressing while the golden raisins plump and get juicy. Hearty and satisfying, it’s a welcome addition to mealtime any time of year. Whisk first 8 ingredients together in the bottom of a large bowl. Add the kale ribbons to the bowl and with clean hands, firmly massage the leaves to work in the dresing. The leaves should look a little darker and be softer in consistency. 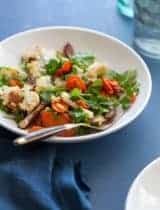 Add the carrots, chopped olives, mint, parsley, raisins, and dates and toss to combine. Let sit for at least 10-15 minutes for the flavors to combine. Toss lightly again before serving at room temperature. oh those flavors sound amazing! and it is so pretty! love the ribbons - it makes it easier for kids to eat - great idea I think i will try it for the girls! Such a beautiful healthy salad! Can't wait to try it! This is such a genius and simple idea! Love it! This sounds incredible! I love dates so much, and it's about time I have them in a savory dish! 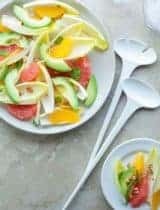 Fabulous and beautiful salad! Pinned! This looks beautiful! Love all of those ribbons. Pinning. I'm sure this salad tastes as pretty as it looks! 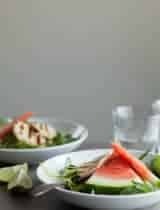 Stunningly beautiful and nutritious recipe! I love all the spices and the addition of the raisins for sweetness and texture. I add raisins and nutmeg to sauteed greens, too! This salad is healthy looking and I love the spices you used. I can't wait to try this salad...it looks delicious! I know my husband is going to love it too! I LOVE this salad. 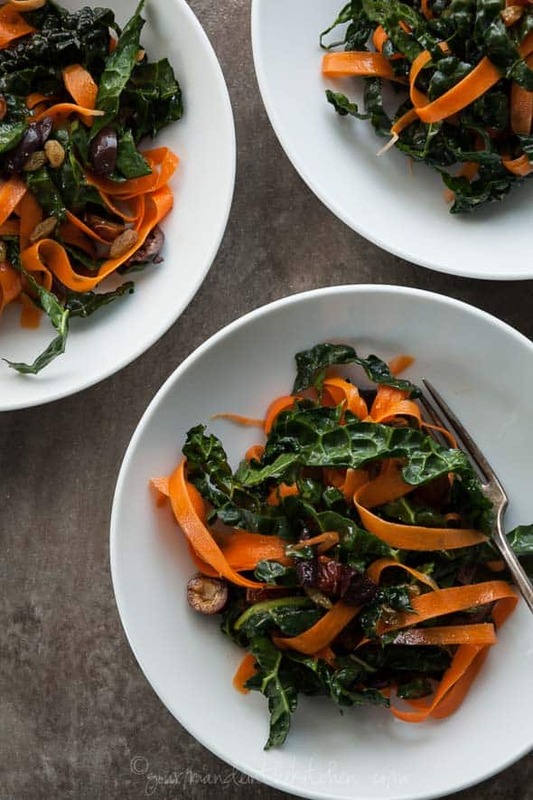 Winter is no time to slack in eating your vegetables and this salad is proof of that! Loving the flavors in this salad! :) It looks so fresh & healthy too. What a beautiful salad. I love the flavors and textures. Stunning and delish as always!! 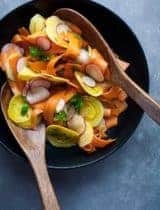 Such a lovely combo of winter vegetables! I love all of the spices too. This salad is so beautiful! I love how simple it is too! This is such a beautiful salad! Thanks for sharing!